Actuality: Causative agents of tetanus and gas gangrene relate to cause the wound infections. The diseases caused by them are taking hard course and without the professional medical intervention can result in the death of the patient. The preparations that can form the antitoxic immunity (active and passive) play an important role in the prevention of these diseases. The method of approach can be explained by the biological properties of the causative agents of these diseases. Non-clostridia anaerobes cause the diseases at first in the weakened people (for example, in postoperative period). Microbiological diagnostics of infections caused by non-clostridia anaerobes is not used widely in the medical practice because the receipt the pure cultures of the anaerobes has features. This influences the effectiveness of the treatment. Primary objectives: to be able to conduct and evaluate the microbiological diagnosis of the anaerobic infection. 1. The general characteristics of the pathogenic spore-forming anaerobes (clostridia) – C. tetani, C. perfringens, C. septicum, C. histoliticum, C.novyi, C. botulinum. 2. Epidemiology, pathogenesis, microbiological diagnostics, treatment and prevention of the tetanus and gas gangrene. 3. The general characteristics of non-clostridia anaerobes – bacteroides, fusobacteria, propionibacterium, veillonella, eubacterium, peptococcus, peptostreptococcus, bifidobacterium. Task 1. Microscopically examine the preparation from the patient’s material. Draw the preparation in the protocol. Task 2. Examine the growth of anaerobes on the media. Enter the description of cultural properties in the protocol. Task 3. Study the methods of anaerobic conditional creations. Task 4. Examine the biochemical properties of bacteria and make the conclusion. Write down the results of the experience in the protocol. Task 5. Study and write in the copybook the main antimicrobial drugs used for treat­ment, prevention and diagnostics of anaerobic infections. Task 6. Prepare the smear from soil anaerobes. Stain it by Gramm, microscopically examine it and draw in the protocol. C. tetani is rod, length from 1 to 6 mm, Gram positive. The bacteria are placed isolated and form the round terminal spore. The size of the spore is more than thick of the bacteria therefore the cell has the shape like a drumstick. When the smear is stained by Gramm method the spore becomes colorless with violet contour. When the smear is stained by Ziehl Neelsen method the spore as acid-stable structure becomes red in color, the body takes on blue color. B.bifidum is non spore-forming anaerobes, members of the normal flora of the thick gut; gram- positive, like branchy rods. Peptostreptococcus is gram-positive streptococcus, non spore-forming anaerobe. C.perfringens on the blood-sugar Zeissler’s agar forms a small round grey colony. The medium contains glucose, blood and agar. This medium is placed on the Petry dish and used for isolation the colony. Fortner dish is a dish with Zeissler’s agar and it is a biological mechanical method of making anaerobic conditions. The medium is divided into two parts (the furrow is made in the dish center by scalpel). The aerobic and anaerobic bacteria are growing on the different parts of the medium. Sugar MPA consists of the nourishing medium and glucose as a reduced matter. The reduced matters promote to lowering the oxidizing possibilities of the media. Kitt-Tarozzi medium is a nourishing broth with 0.5% glucose and piece of a liver and minced meat for oxygen absorption. Before inoculation the medium is warmed thoroughly on the water bath for 10-15 minutes to remove oxygen (regeneration of the medium). After inoculation the medium is covered with Vaseline oil to prevent interaction of gases with surroundings. C. perfringens grows onit with formation of the gas and dimness of the liquid. Litmus Milk is fatless and regenerated for oxygen absorption like Kitt-Tarozzi media. C. perfringens forms in it after 3-4 hour cultivation like sponge clot rice. It contains bubbles of gas and transparent liquid. 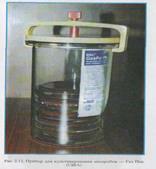 Vilson-Blerr medium is an iron-sulfate agar. It consists of nourishing medium with glucose, Na2SO3, FeCl2. The medium is filling tubes like high column. The inoculation is making prick in the nourishing medium. Anaerobic clostridia make the dark of the media to inoculation stroke because Na2SO3 reduces in Na2S that connects with FeCl2 and makes black sediment. After cultivation, C. perfringens forms black culture in the deep of the Vilson-Blerr medium. Anaerostat is an apparatus that can support the constant temperature and it allows producing anaerobic conditions for cultivation. It is closed hermetically. Vacuum pump pumps out side the air from the camera of the anaerostat. Method of Veyona-Vinyala is used for isolation colonies from anaerobes. It consists of the preparing serial dilutions of the investigated materials in the fusion-nourishing agar. The nourishing agar take in the Paster pipettes with solder end. Thus, in that way, in the thickness of the medium anaerobic conditions are made. The pipette is placed in the thermostat with optimal temperature. The grown colony is obtained when the pipette is cut up or the end of the pipette is broken. Exicator can be used for cultivation anaerobes. The culture is placed inside the exicator. The chemical method is used for the release of oxygen (the steams of the chemical matter that interacts with oxygen is placed on the bottom of the exicator).